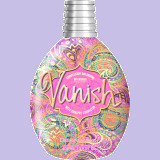 Designer Skin Vanish Intensifier with Sunspot Corrector. Complexion Balancing Intensifier with Sunspot Corrector. Intensifying Tyrosine Blend promotes natural dark color development.